Once thought to stay shallow, a new study finds the tusked mammals are among the deepest divers in the sea. (Inside Science) -- Walruses may not be as fast or agile as their seal cousins, but apparently they can dive deeper than most. Even though diving prowess is high among "pinnipeds," the family of semiaquatic mammals to which they belong, walruses were long thought to be one of the few members of this family incapable of diving deeper than 100 meters. But a new study provides evidence that they can, in fact, dive deeper than most seals and sea lions. In 2010, scientists from the Greenland Institute of Natural Resources traveled to the Arctic Circle to study the diving behavior of a group of Atlantic walruses living in the high Arctic. With the help of some local Inuit hunters, the researchers located 21 walruses and used harpoons to embed small satellite transmitters into their blubbery hides, which allowed them to monitor the movements of the walruses. They spent the next three years monitoring the movements and foraging habits of these walruses, and according to their findings, which were published in February in the journal Experimental Marine Biology and Ecology, they discovered that the walruses sometimes dove as deep as 500 meters. Of the 33 living species of pinnipeds, only 10 are known to dive deeper. During the summer of 2013, one of the walruses dove into the icy waters of Smith Sound, a desolate Arctic sea passage between Greenland and Canada's northernmost island. Thirteen minutes later the walrus resurfaced, allowing its transmitter to send a shocking piece of information. The transmitter reported that this walrus had traveled to a depth of 500 meters. 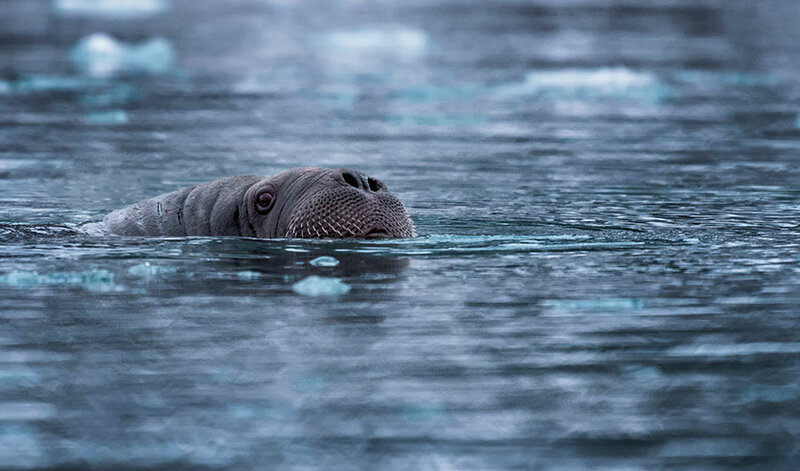 When the team first saw the data suggesting what was by far the deepest dive ever recorded for a walrus, they assumed the transmitter had malfunctioned. “It was very surprising,” recalls Mads Heide-Jørgensen, professor of marine biology at the Greenland Institute of Natural Resources, who helped conduct the study. The team observed a total of four dives beyond 500 meters before the study was over. These dives were made by two females walruses; the researchers didn’t observe any male walruses making deep dives. However, this was likely due to the fact that only three of the 21 walruses observed in this study were males. Male walruses may be able to dive even deeper because they can weigh twice as much their female counterparts and typically have thicker skin. The same is true for the two species of elephant seals. The males are the better divers, known to dive to far greater depths than the females. “The biggest animals make the deepest dives because they have the highest capacity to keep a high level of oxygen in their body during the dives,” said Heide-Jørgensen. He believes male walruses may be capable of diving to depths well beyond 500 meters. Walruses don't appear to use their deep diving skills very often. Along with the quartet of 500-meter plunges they tracked, the researchers observed hundreds of relatively shallow dives. “They're not passionate divers like some of the seals we know,” said Heide-Jørgensen. “They spent most of their time hanging out on ice flows that are drifting over shallow banks." When feeding, walruses swim just above the seabed, using their sensitive whiskers to locate prey such as clams and mussels hiding beneath the sediment. Walruses feed primarily in areas where the water is shallow and abundant sea ice offers access to offshore water feeding areas and a place to rest between dives. According to the study, walruses in the high Arctic rely heavily on a handful of shallow water feeding areas in Greenland and Canada. A gauntlet of sea ice has kept ships out of these waters for more than a century, but this natural barrier is disappearing. According to the National Snow and Ice Data Center, sea ice coverage in the Arctic has been declining rapidly since the late 1970s. Average sea ice coverage in the Arctic for the month of February reached a new low in 2018. “If the sea ice continues to decline, we can expect more shipping and industrial activities in the area,” said Heide-Jørgensen. What receding ice will mean for walrus survival is not yet known, but it could lead to increased shipping traffic and new commercial fishing, both of which could impact walruses' habitat, said Arnbom.